An exhibition at the Japanese American National Museum in Los Angeles includes a fascinating glimpse into how origami has inspired medical technology engineers. If you are in Los Angeles between now and August 26 and have an unfolding interest in origami and medical technology—they are not mutually exclusive—you might want to pencil in a visit to the Japanese American National Museum. An exhibition titled "Folding Paper: The Infinite Possibilities of Origami" includes a fascinating glimpse into how the Japanese artform has inspired medical technology engineers. One of the exhibits shows a prototype of a collapsible cardiac stent using the water-bomb base origami technique, a rounded cube form that folds flat and is inflated via a hole in a corner of the construction. 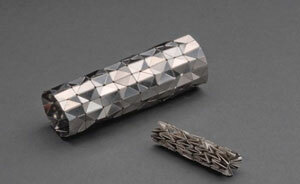 Developed by a British-Japanese team from Oxford University, the stent origami was used "to create a prototype from stainless steel that can be reduced from a width of 23 to 12 mm," writes Susan Bell of the LA Weekly. The roots between origami and advanced research run deep, she adds. Exhibition advisor Robert J. Lang, who holds a doctorate in physics from the California Institute of Technology (Caltech) in Pasadena, CA, gave up a "career as an eminent physicist and mathematician with NASA's Jet Propulsion Laboratory to devote himself full-time to his passion for folding paper," writes Bell. After its run in Los Angeles, the exhibition moves to the Leigh Yawkey Woodson Art Museum, (Wausau, WI; January 26 to April 7, 2013); Crocker Art Museum (Sacramento, CA; June 22 to September 29, 2013); and Peoria Riverfront Museum (Peoria, IL; January 31 to April 27, 2014).